This week’s pose is Navasana. Nava= Ship, boat or vessel, and Asana= pose/posture. There are 2 versions of this asana – Paripurna (full/complete) and Ardha (half). Today we are looking at the full version of Boat Pose. 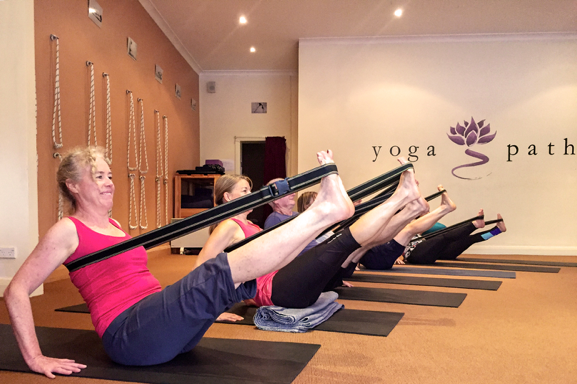 You enter the asana through Dandasana (staff pose) that we looked at a few weeks ago*. It’s an intense asana that resembles a boat. I’ve just read out the instructions from Light on Yoga to my 12yo daughter and she says “OMG that’s hard”. 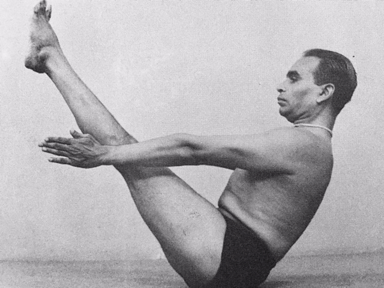 Mr Iyengar says the effect of the asana is felt after only 20 seconds. A long 20 seconds! One of the essential elements to this asana (as with all asanas) is to BREATHE. We need to learn to observe, feel and listen to our breath. Last Sunday in my Pranayama Workshop, we experimented with Sanmukhi Mudra, placing the hands on the face to close the ‘gates’ of our outer awareness. So we can listen to what’s happening inside. When you block your ears you block the outside world and you can hear your breath; its quality, its rhythm. You listen intently. When we listen with both ears, with openness, the frontal brain becomes quiet. The frontal brain is the analytical brain, the part of the brain in its continual analysis of good or bad, right or wrong. This is the part that causes us to judge, criticise, discriminate, that can lead to self-righteousness and conflict. So when you listen intently you cannot compute with your analytical brain at the same time. Guruji (BKS Iyengar) often spoke about the ears being channels to our Soul. So this Christmas make it your practice to really listen to those around you with open-heartless and compassion.